This Burns Flyte Guitar was originally built in the mid 70, inspired by the Concorde aircraft. Jim Burns wanted to create a truly original body shape for a guitar. The late Mark Bolan of T-Rex used to play a Burns Flyte Guitar. The guitar is very well balanced, despite its odd shape and fits well into the body. No problem standing up or sitting down. I met the USA distributors for Burns London at a NAMM show, impressed the reps with my playing and walked away with the Flyte Guitar. It was my main touring and playing guitar for quite some time and is still in heavy rotation at the ShredZone. It absolutely rocks! Great unique body shape and incredible balance. This guitar immediately became a Shredmistress Favorite. The Tri-Sonice pickups sound awesome – full-on shred to subtlety. Easy to play and navigate. 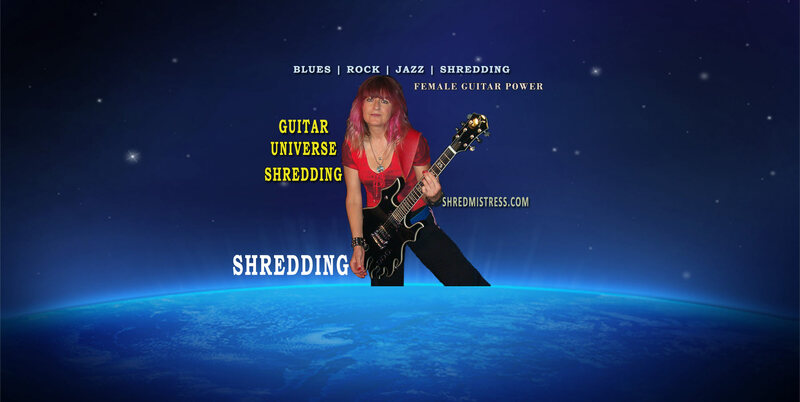 Can’t say enough about this shredding thang. Burns USA folded but Burns London still makes some great guitars and carries on the Burns Tradition.